One edible decoration every cake decorator needs to know how to make is a gum paste or fondant stand up number topper! Number toppers are one of my most requested edible decoration pieces for birthday cakes, and they are so simple to make! And adding them to a birthday cake gives it that special, personal touch. To learn how to make them yourself, just follow along with this simple tutorial! To begin this project, I like to print out the numbers in the size needed for my cake. Tape the sheet with your printed numbers on a flat surface (I'm using a tray, so I can easily move my numbers to a place where they can dry undisturbed). 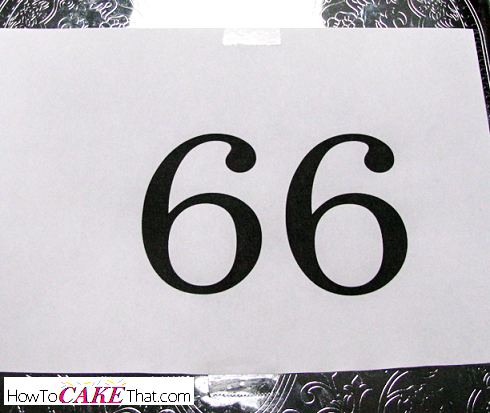 These numbers will be a guide to help ensure both of the gumpaste numbers are the same size and the same shape. 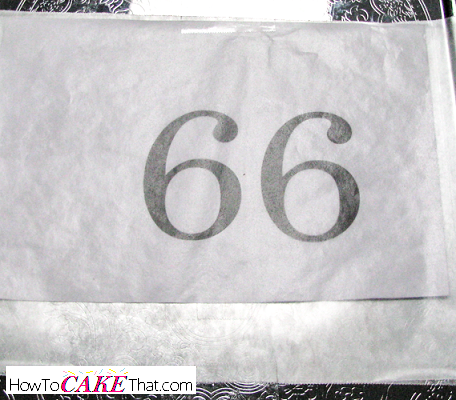 Next, tape down a piece of nonstick transparent paper over the sheet with the printed numbers. I'm using a sheet of wax paper. Now we need to estimate how long of a piece of gum paste/fondant we will need to make our number. 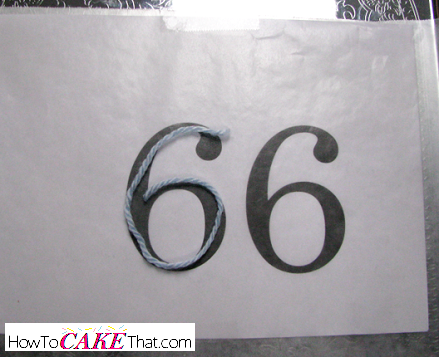 If you're using a number that would be difficult to measure (like a "6"), then use a piece of string to trace around the number and cut it to size. Next, lay out your string on your work surface. Dust work surface with cornstarch. Then, using a mixture of 50% fondant, 50% gum paste, roll between your palms until your fondant/gum paste is in a very thick noodle (or snake) shape and is the desired thickness. 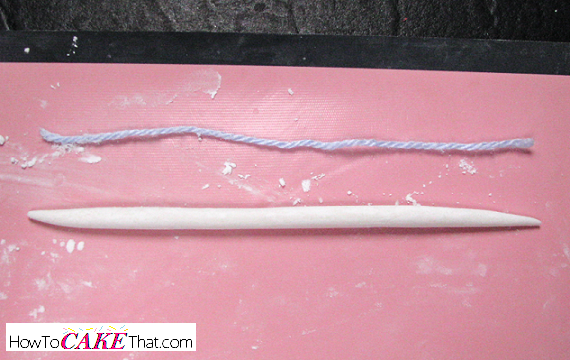 If you would like the ends of your fondant numbers to thin out and come to a point on the ends, trim your fondant snake slightly shorter than the length of the string. Using your index finger, gently roll the end until it becomes thinner and forms a point. Make sure the finished product is the same length as your string guide. Note: You do not have to use a 50% fondant, 50% gum paste mixture. If you have only fondant, just knead a little tylose powder into your fondant to help with drying. Or if you need your numbers to dry very quickly, use 100% gum paste. Now it's time to shape our number. 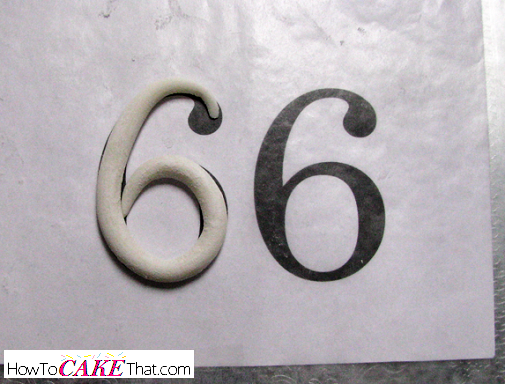 Pick up your fondant "snake" and lay it on the nonstick paper covering your number guide. 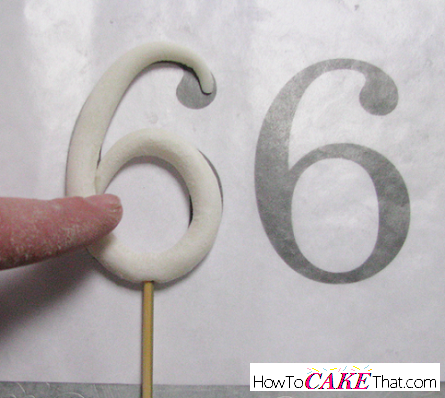 Form the fondant into the number shape. 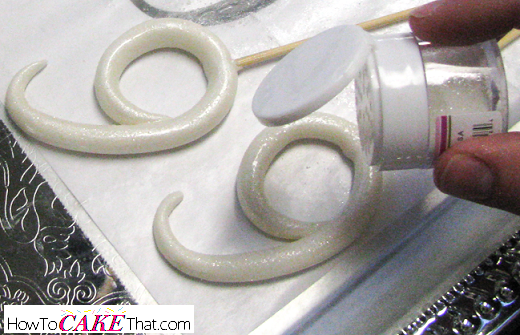 Feel free to add any swirls to the ends of the fondant snake. Jazz it up any way you'd like! 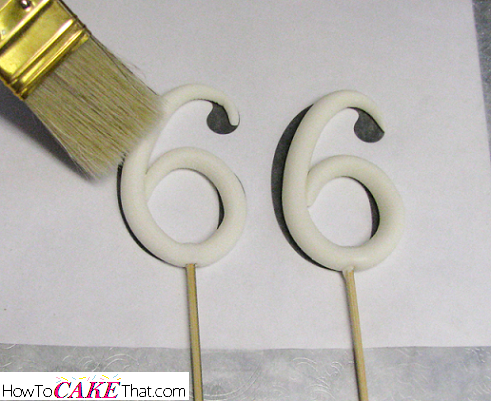 If your gum paste number has an end that connects back to the number, dip a small paintbrush in a little water and paint where the two pieces meet. The water will help ensure the pieces stick together when it dries. Now it's time to insert the support that will make your numbers stand up! I like to use bamboo skewers. For these little numbers, I just needed one skewer cut in half. Each half was more than enough to hold up these two numbers. Trim the skewers to the length needed for your project before inserting them into the numbers. Also be sure to dip the end of your skewer in water to ensure the gum paste will stick to the skewer. 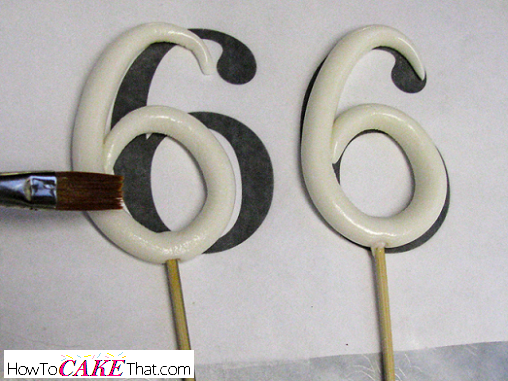 Set the gum paste numbers aside and allow to dry completely - drying times will vary depending on the temperature and humidity level in the air. My numbers took about a day and a half to fully dry. Note: If you are in a pinch and need to dry your topper quickly, place your numbers in your oven, close your oven door and turn just the oven light on (do NOT turn the heat on!) and let them sit. Depending on their size, they may dry in just a couple of hours or overnight. Note: If for some reason your bamboo skewer didn't stick to your number topper, simply make paste with a little gum paste and a little water and use just a tiny bit on the end of your skewer to glue it to the number. 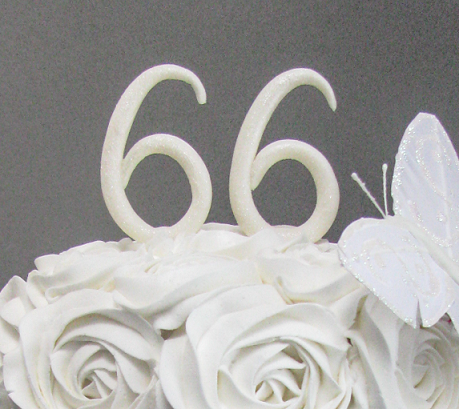 After your number topper has dried, use a large soft brush to gently dust off any excess cornstarch. For my topper, I wanted to add a little sparkle. I wanted to sprinkle some white disco dust glitter onto my numbers. To do this, I brushed a very light amount of water over my numbers (you could use a steamer if you own one). This will make the surface of your numbers sticky and able to hold any glitter or shimmer dusts you'd like to use. Then I sprinkled a little Disco Dust onto the wet surface and placed my numbers on my cake by inserting the skewers into the cake. And there you have it! An easy way to add that perfect touch to your next cake!